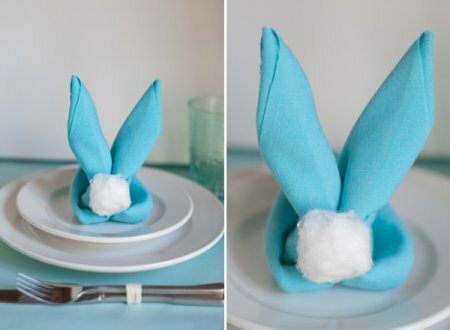 For Easter and for bunny lovers, I thought it would be fun to share my collection of easy ways you can fold adorable bunny napkins to adorn your table. 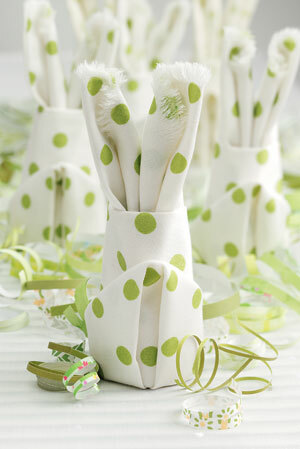 Sugar and Charm has its super cute spin on a popular bunny napkin fold. Its easy video tutorial is here. 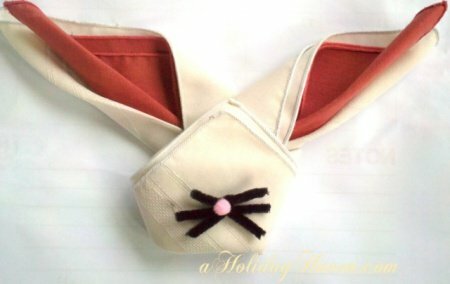 Folding instructions for this classic bunny napkin are all over the web. I liked the ones shown at Taste of Home. I think the clearest instructions for how to fold them are at GoodHousekeeping.com. 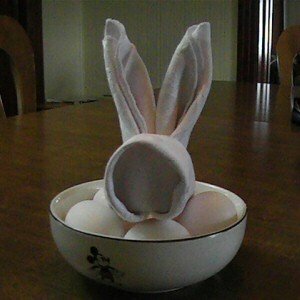 This Easter Bunny Napkin is so ridiculously easy, you almost don't need to see the instructions. Whoops, we can no longer find the instructions, but from the picture, it is easy to tell what to do. Holiday Haven had a super easy way of folding an Easter Bunny Napkin using two napkins, a pipe cleaner, and one fuzzy puff. Unfortunately we no longer have the link to the instructions. 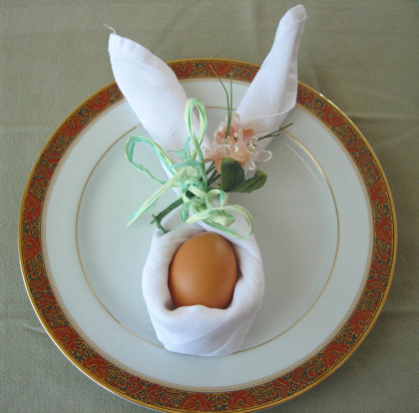 Can you figure out how to make an Easter Bunny Napkin that looks like this? 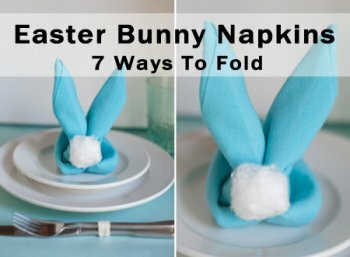 Fold Napkins has another cute way to fold bunny shaped napkins. Foldnapkins.com's instructions include presenting the folded napkin in a bowl of colored eggs. I also think it would be fun to put it in almost anything bright and colorful, perhaps colored Peeps or jelly beans. Resurrection Fern has a nice vintage take on folding Easter bunny napkins. Its instructions for folding can obviously be used for any napkins. I think they look charming. I think Martha Stewart's Easter Bunny Napkin is a variation of the Classic Easter Bunny Napkin above. But I liked her elegant presentation, and her instructions are great, so I thought it worthy of including here. I hope you enjoyed my collection of some of the easy ways you can fold napkins to add a festive and fun touch to your table. 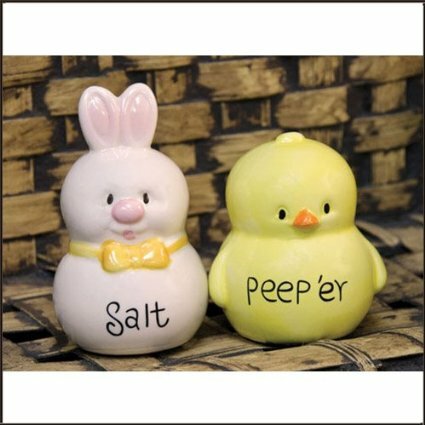 To add an extra boost of cuteness, you may want to add some really adorable Easter themed table accessories like this bunny and chick salt and peeper set or the bunny set below. 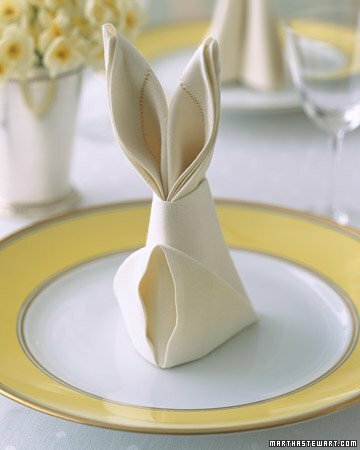 Which is your favorite Easter napkin fold? 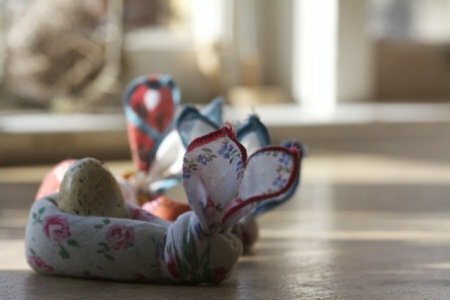 Do you have any suggestions for other easy ways to craft a fun and fabulous Easter table? For Easter laughs, check out these 13 Awful Easter Bunny Family Photos. First published March 2012 and updated April 2017.